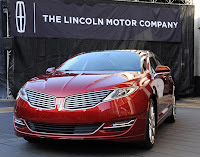 As reported earlier, Lincoln will for the first time advertise at the Super Bowl 2013. Lincoln is relaunching its branding with The Lincoln Motor Company name. This is the original name from the 1920s. The Lincoln Super Bowl 2013 Ad will be pushing this new name with a Twitter theme according to USA Today. So far Twitter appeared as hashtag at the end of Super Bowl commercials. Now Twitter becomes a topic in a Super Bowl ad. Lincoln will use five crowd-sourced tweets curated by comedian and late night host Jimmy Fallon. The tweets are about weird road trip experiences and the Lincoln Super Bowl 2013 will enact these road trip "tweets." I already like the idea that Lincoln is aiming to make a funny Super Bowl ad. Jimmy Fallon is great comedian. I have high hopes that the Licoln Super Bowl 2013 ad will be really funny.